In order to ensure all affiliates are in sound legal and fiscal health, the Academy of Nutrition and Dietetics requires adherence to the annual Principles of Affiliation submission requirement. Clarify the legal and fiduciary responsibilities between the Academy and the affiliate. Limit exposure of the organization, officers, directors and members to legal and financial liabilities. Promote and protect the integrity and interests of the Academy and the affiliates through the establishment of consistent business practices. Each year, the affiliate must submit the following items via an online submission site. All affiliates must submit required documents via the online submission, as specified in the Principles of Affiliation Agreement, in order to obtain the 20% dues rebate from the Academy of Nutrition and Dietetics. Rebates will be held until an approved submission is completed. Learn more about affiliate rebates. 1. Certificate of Good Standing from the state the association is incorporated in or a copy of the most recently filed annual report filed with the state of incorporation. 2. A copy of federal (IRS form 990, 990EZ, or 990 Postcard) and state income tax filings for affiliate and foundation (if applicable). 4. Affiliate Annual Assessment completed and signed by the president and past president. (The assessment will be completed via online survey. The attachment is posted to help you collect the data in preparation of completing the online assessment. 5. Copy of the current bylaws. 6. Copy of district internal or external agreement**. **If the affiliate has transitioned to regions, an internal or external district agreement does not need signed. Please notify the Affiliate Relations Team of the change in structure if the information has not already been shared. Below is a checklist to help affiliates prepare for submitting the Principles of Affiliation Report. Download a copy of the checklist. Yes, the affiliate president has completed and signed the online Principles of Affiliation Agreement. Yes, the affiliate has submitted the affiliate annual report and competed the online assessment. Yes, the affiliate has uploaded copies of district agreements – both internal and external. Yes, there are policies in place to monitor and ensure that affiliate members and district members are members of the Academy. 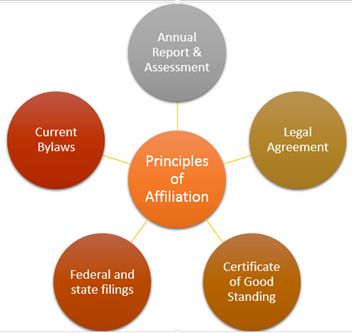 Yes, the affiliate has submitted a copy of a certificate of good standing issued by the state from the current membership year or a copy of the most recently filed annual report filed with the state of incorporation. Yes, the affiliate’s tax-exempt status remains in good standing with the IRS as tax-exempt under a 501(c)6 or 501(c)3. Documentation of the 990 tax form or an annual notice from the IRS has been uploaded. Yes, the bylaws are consistent with the Academy’s provisions in the areas of membership categories, rights, and privileges. A copy of the bylaws has been uploaded.